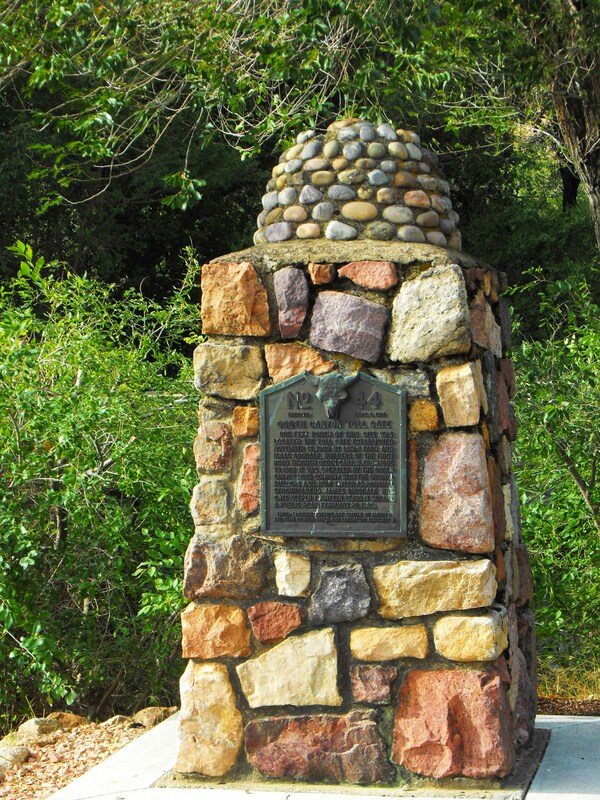 Monument located at mouth of Ogden Canyon in Rainbow Garden north parking lot. Isaac Newton Goodale was born 1815 in Berkshire, New York, and was named after Sir Isaac Newton, an English mathematician and philosopher who formulated the binomial theorem, the laws of gravity and motion, and the elements of differential calculus. Such an honor was not lost on Newton or “Newt” as his friends affectionately called him. He attended school from ages 9 to 15 but was a self-taught, life-long learner gifted in principles of civil engineering. He used his gifts in callings to survey and build roads and canals in Weber County that are still used in 2013. At age 15 his family moved from New York to the Michigan wilderness, and at age 24 he had a remarkable vision the day before the Mormon missionaries arrived at his parents’ home. He was the only member of his family that studied the Book of Mormon and learned that it was true. In 1841 he left Michigan and moved to Nauvoo. He worked on the Nauvoo temple, served a mission and suffered the mobs and burnings of homes and expulsion from Nauvoo. On May 12, 1846, he recorded in his journal that he “started for the Rockey Mountain to find a Asalum (asylum) for the opressed”. After living in Winter Quarters he arrived in the valley of the Great Salt Lake on 19 September 1847. Brigham Young married Isaac Newton Goodale and Louisa Maria Bingham, daughter of Erastus and Lucinda Bingham, on January 17, 1849 in Salt Lake City. Goodale wrote in his journal that he would “long remember this day”. 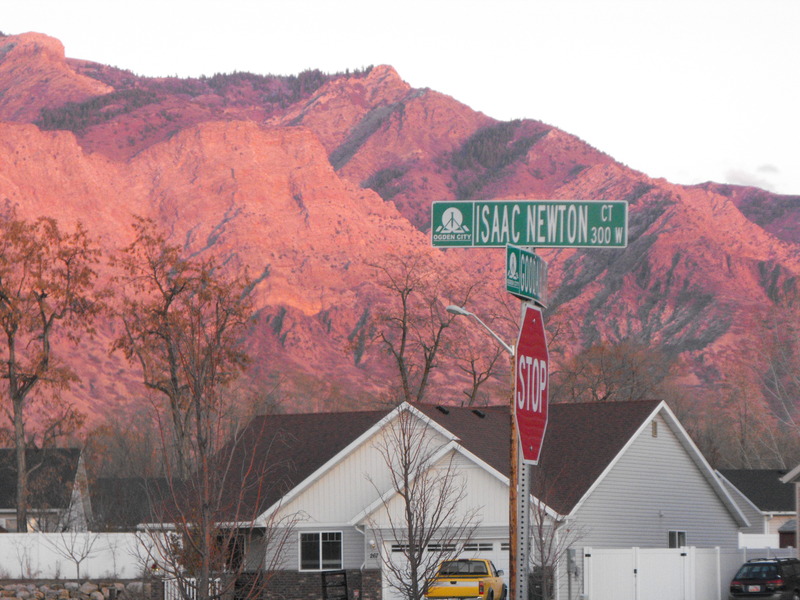 Seeing that Isaac Newton Goodale had skills as a surveyor Brigham Young sent him to “Little Salt Lake” (Parawon) in Iron County from January to September 1851 to survey roads and engineer the Parawan Canal. During this time his wife stayed in Weber County with her parents and delivered a baby in Farr’s Fort in February 1851. 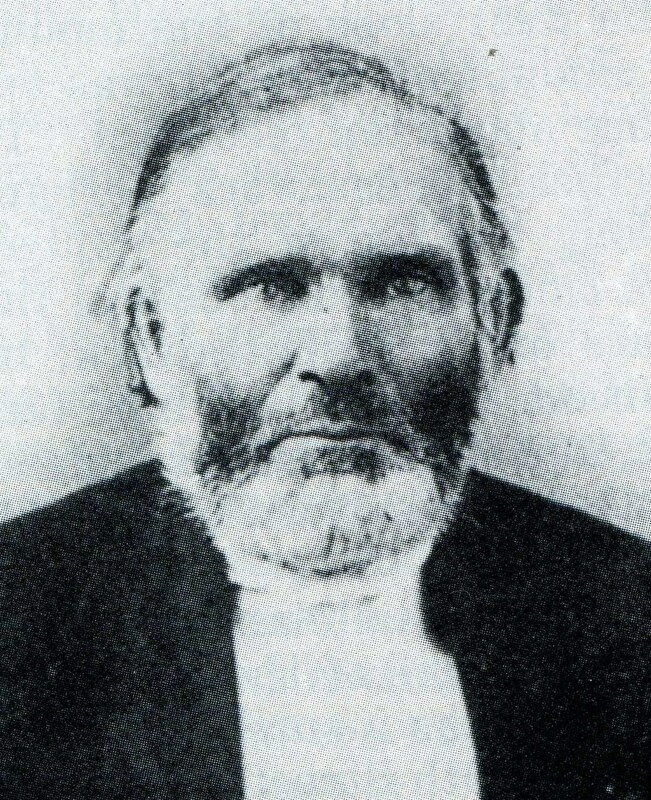 After finishing the work in Parawon he came to Weber County on 1 Oct 1851 finding his wife and family well. They returned briefly to Salt Lake City, and in February 1852 Goodale moved his family again to Ogden joining the Bingham family on 2nd Street. While establishing his farm and meadow on 2nd Street, he also recorded going to military training and learning sword exercises. In September he was asked to make the plans and write out the bill for the building of the first school on 2nd Street. Goodale worked hard on the log school which was completed on Dec. 31, 1852, just in time for a New Year’s dance the next day. It was known as the Bingham School (located at intersection of 2nd St. and Lynne School Lane). There were Indian wars in central and southern Utah. Bloody violence was avoided in Weber County, but fear that the Indians would attack settlers in Weber County induced cautionary measures. Brigham Young ordered Weber County to “fort up”. Goodale was chosen on the committee to locate and lay out the fort in his district and then was chosen to be a military commander. In the spring of 1854 the course of Isaac Newton Goodale’s work changed from building a fort, roadways and small irrigation canals. President Brigham Young urged settlers to move into Ogden and build up the city. 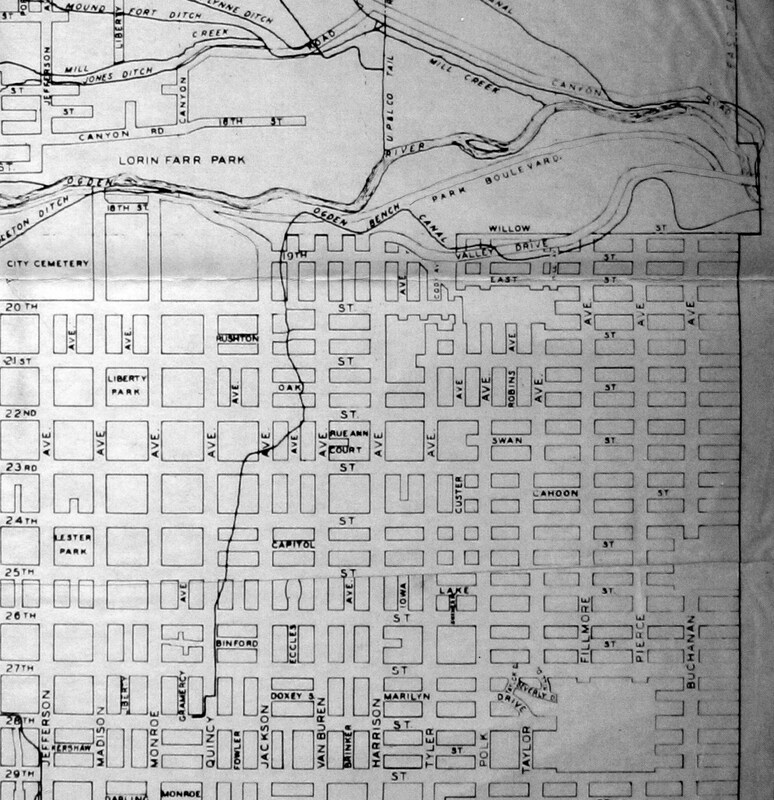 Homes on the bench would need water for the necessary livestock and gardens, and Young appointed Goodale to survey a canal from the Ogden River upward to the bench above Ogden and then to supervise its construction. It was essential for Ogden’s development to bring water to the bench land. Until this time, the waters of the Ogden River had been diverted at at the mouth of the canyon only to the north side of the river. All diversions to the north followed gravity and the natural downward slope of the land. On the south side of the river was a steep embankment. Goodale started at the diversion point a little above the mouth of the canyon near the first bridge and conveyed the water to the mouth of the canyon in an elevated wooden flume. From this point above the floor of the canyon, he took the water slowly up another five feet from the gorge, along the high south bank to a point near today’s Jackson and Van Buren Avenues where the canal turned south and entered the bench. The Ogden Bench Canal was considered a wonderful job of engineering, an amazing feat that turned the arid bench area above Ogden City into a watered garden. Today one can stand in the El Monte golf course and gaze at the high bank to the south and envision the construction of the canal along the hill with picks and shovels and crude instruments. Until Isaac could obtain a transit or surveyors level, this work was done with a carpenters level modified for horizontal sighting. 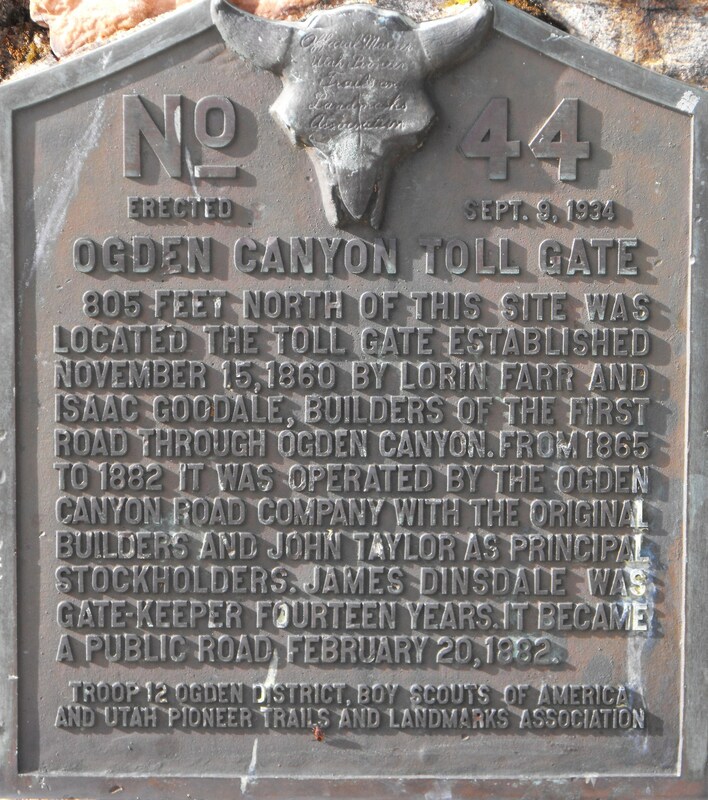 In 1857 Mayor Lorin Farr appointed Goodale superintendent of building the road through Ogden Canyon to Huntsville. The mouth of Ogden Canyon was a very narrow gorge through which people did not travel during the first 12 years of settlement. They entered the canyon higher up and on the north side in order to go around the wild, narrow gorge that was its mouth. Building in that formidable gorge was a difficult and expensive undertaking in those days. The cost of constructing the road from Ogden to Huntsville was $19,000 in one report and $50,000 in another. The new road went up the north side of the gorge. No explosives were used on the original road. Instead log cribs [a frame of beams] were made and then filled with rocks and gravel and brush upon which the roadbed was built. Portions of the road would wash out during high water and have to be rebuilt. After the initial opening in 1860 Goodale built three bridges that helped the road very much. When that was completed he began the task of continuing the Ogden Canyon Road to Bear Lake. 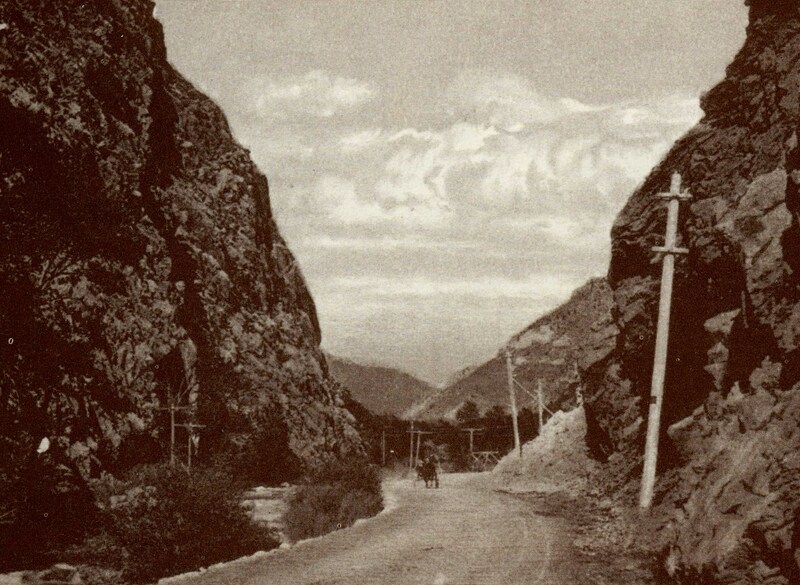 Ruggedness of Ogden Canyon visible in post card c. 1925; first road surveyed by Isaac Newton Goodale. In 1857 he took a second wife, Emma Foy, and six children were born from this marriage. Isaac Newton Goodale served as a school trustee for 22 years and as an Ogden City councilor for 15 years. In the early history of the city, there was no pay for such offices. The assignments that Brother Goodale received, whether it be in building walls, canal, roads, or surveying, were missions in the sense that they did not normally bring wages and must be accomplished with complete dedication. Sometimes he or the workers might receive produce or reciprocal services, but only sometimes. His wife Maria had much of the responsibility of home and family, and the children had to help make the land provide nourishment and clothing. He and Maria had 13 children. Emma Foy died in 1869 and Maria reared two of Emma’s daughters with the same motherly care and attention as her own children. Isaac Newton Goodale was respected and beloved by his family and hundreds of friends. He was a modest man who never sought for his own aggrandizement but worked for the welfare of his people. He was a public servant all of his life surveying roads and canals in Weber, Salt Lake and Iron Counties, leaving an indelible pioneer fingerprint on the development of Utah that still remains. He always expressed his conviction of the truthfulness of the Mormon doctrines in a most positive manner. All his immediate relatives in Michigan, including his parents, considered he had disgraced the family by joining the Mormons. 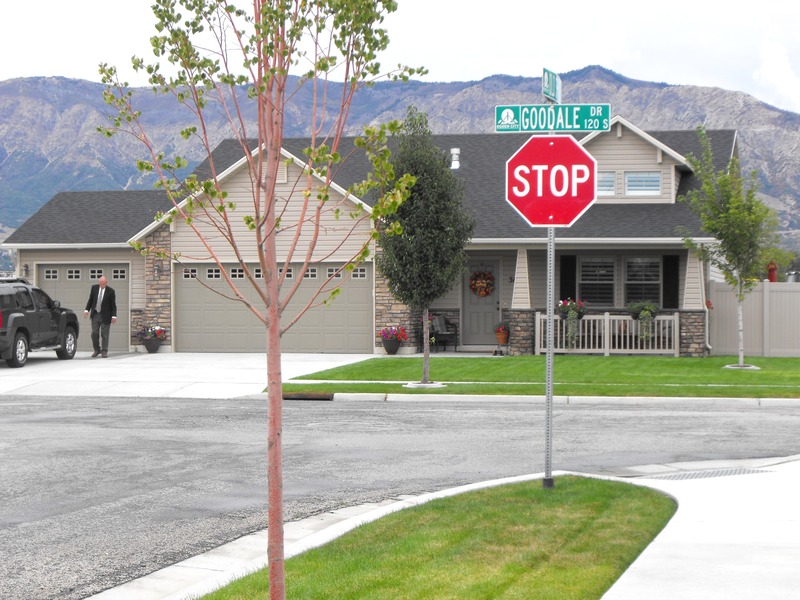 It did not cause any humiliation to him, and up to the day of his death he showed great joy and interest in talking with others about the Prophet Joseph Smith and the doctrines of the Church of Jesus Christ of Latter-day Saints. He died April 26, 1890. Isaac Newton Court; photo Nov. 2014. Joyce B. Maw, Isaac Newton Goodale Life History, manuscript, 1996, p. 2-4. The Isaac Newton Goodale Journal, 1850-1857, transcribed by Elden J. and Anne S. Watson, manuscript, 1981, p. 8, 20, 25. Joyce B. Maw, Isaac Newton Goodale Life History, p. 13. Obituary of Isaac Newton Goodale, Death of A Pioneer, Ogden Standard, April 27, 1890; Joyce Maw, Isaac Newton Goodale Life History, p. 20. Joyce B. Maw, Isaac Newton Goodale Life History, p. 26. Electa Goodale and Martha Goodale Buswell (daughters), Isaac Newton Goodale, manuscript, p. 2.